Paul did not focus solely on the National Security Agency's mass surveillance program. He used parts of his time to discuss other forms of surveillance and pointed out that certain provisions of the PATRIOT Act are frequently used, not to combat terrorism, but to investigate domestic crimes. In the second hour of his filibuster, Paul spent time talking about how the Internal Revenue Service ostensibly conducts surveillance on bank deposits to look for suspicious deposits. Under the Bank Secrecy Act, financial institutions are required to submit reports on cash deposits of $10,000 or more. The IRS claims to use the reports to fight money laundering connected to terrorism and drug crimes. Frequent cash transactions under this monetary threshold -- which the IRS believes to be the "structuring" of deposits to avoid mandated reports -- can put innocent people and their money in the crosshairs of the powerful tax agency. Too often, the IRS seizes the cash through federal civil asset forfeiture, leaving innocent people, who must prove their money's innocence, to face a frustrating and lengthy legal battle to get it back. "Not too long ago there was a Korean husband and wife, they owned a grocery store, they dealt in a lot of cash and they were very successful and they deposited three times a day over $9,000, $8,000 to $10,000," said Paul. "They tried to stay under $10,000 because there was all kinds of paperwork if you’re over $10,000. The government said you’re structuring your deposits to evade the people. You must be guilty of something. The government then can accuse people of a crime and take their stuff." He described civil asset forfeiture citing the case of Christo Sourovelis, whose 22-year-old son, Yianni, was caught selling $40 worth of drugs out of the family's home. Sourovelis was not aware of what his son was doing, but law enforcement simply did not care. "[T]hey decided they would punish the parents too. They confiscated the parents’ house, evicted the family. Teenager makes a mistake selling drugs. What does the government do? They take the parents’ house. You think that is going to help the kid or help anybody get better in the situation by taking the house?" Paul explained. "But here’s the rub. The kid didn’t have to be convicted of anything. The kid didn’t own the house; he was just their kid." "If we allow all kinds of data to be out there to catch people and then we’re not even going to require that you’re convicted of a crime before we take your stuff, you can see the danger of allowing so much data to be collected," the Kentucky Republican continued. "But we are currently convicting and taking people’s stuff or their money simply based on what they’re using it for." Paul warned that this atmosphere sets up an ominous atmosphere, similar to a police state. "When you deposit things, they are obligated to report you to the police. I mean, to the government. Does it sound something like 1984? Does it sound like when you have informants out there everywhere, see something, say something, that your banker is going to call the government if you put cash into the bank?" said Paul. "The burden should always be on the government to prove that you’re guilty of something." 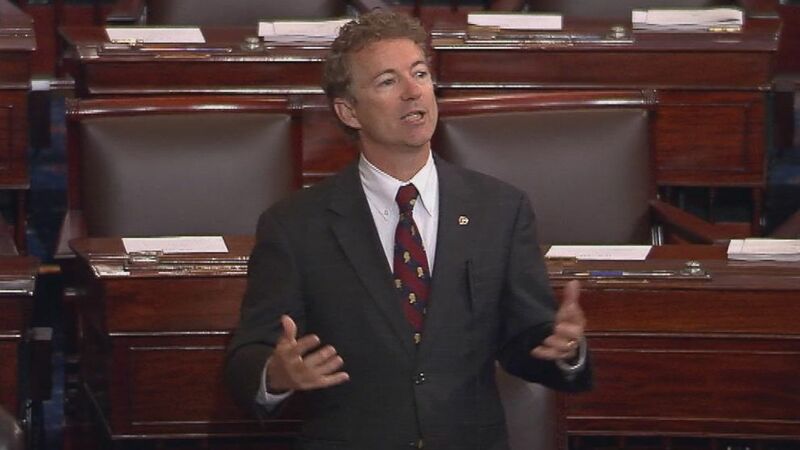 Though much of his filibuster was against mass surveillance illegally conducted under Section 215 of the PATRIOT Act, Paul also spoke out against Section 213 of the law, the so-called "sneak-and-peek" provision, which authorizes the federal government to conduct searches of an individual's home without presenting them with a warrant until weeks later. Section 215 may be up for reauthorization, but Section 213 is permanent law. While some claim that Section 213 is necessary to combat terrorism, audits of its use reveal that it is widely used for domestic crimes. "This is in contradiction to what most people have accepted the Fourth Amendment to be. But if you look at who is being convicted with Section 213, 99.5 percent of the people are for drugs, for domestic crime. What we have done is that we have taken a domestic crime and we say the Constitution no longer applies. We basically got rid of the Fourth Amendment for these crimes," Paul explained. "For about 11,000 people a year, the Constitution no longer applies to them. We are using a lower standard." The Electronic Frontier Foundation has reviewed federal audits of sneak-and-peek warrants, finding that requests rose from a total of 47 between September 2001 and April 2003 to 11,129 in 2013 alone. In the most recent year for which records are available, one half of 1 percent of sneak and peek requests related to terrorism cases. Brilliantly, Paul took the opportunity to talk about the insanity of big government in the courtroom, in the form of federal mandatory minimum sentences for nonviolent offenders. He told the story of Mandy Martinson, a nonviolent offender from Iowa who was prosecuted under federal mandatory minimums. "[Martinson's] mother just died recently. They let her out of prison for a couple of hours. Her dad is getting older, and she wishes she had been there to help her parents. She did mess up. She was a drug addict. Her boyfriend was a drug addict," Paul noted. "They were selling the drugs. He was a meth addict. She was probably going to die if she stayed on the drugs, so it was good that she got off the drugs. She got caught. She got 15 years in prison." Paul noted that "[y]ou can kill somebody in Kentucky and be out on parole in 12 years," but because of the federal mandatory minimum sentence, Martinson, who did not have a prior conviction, was forced to serve 15 years because she had "an addiction." "No judge in their right mind would have ever given her 15 years--nobody would have," said Paul. "The judges basically are telling the defendants and telling the press: I would never do this. This is the wrong thing to do, but I am forced to do this." Paul called out President Barack Obama on the use of Section 213 for domestic purposes. While he believes the White House is committed to justice reform, Paul noted that the President "could today stop this program" immediately for cases not related to terrorism. "He can say we are no longer going to do the bulk collection," said Paul. "Most of these things originated out of Executive order. He could stop these any time he wanted to." While terrorism is often invoked in the debate over mass surveillance and the PATRIOT Act, other forms of mass surveillance for domestic offenses are far too often overlooked in the debate. It may be counterintuitive to link justice reform to problems with this purportedly anti-terror law, but, as Paul explained in detail on Wednesday, the two issues are linked in a unique way. Thankfully, some of the concerns Paul highlighted, such reining abuse of civil asset forfeiture, are echoed by many of his colleagues on Capitol Hill. The groundswell of support continues to grow with each passing day. Provisions of the PATRIOT Act that undermine protected civil liberties, like the use of sneak-and-peek for alleged domestic crimes, must be addressed by lawmakers, though few are willing to step up and fulfill their sworn obligation to "protect and defend" the Constitution.